Vitrectomy Recovery Solutions is a national supplier of vitrectomy recovery equipment rental for patients recovering face down after vitrectomy surgery. 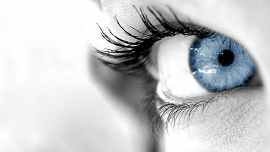 Vitrectomy surgery is often performed to repair a macular hole, detached retina, retinal detachment, vitreous hemorrhage, and diabetic retinopathy. We understand that face down positioning is essential to the success of your surgery. 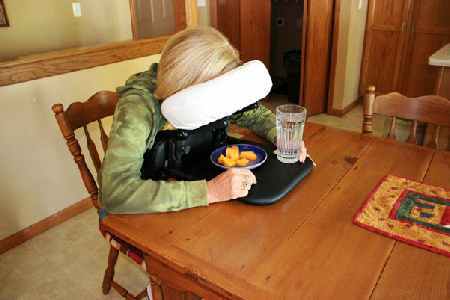 That is why we provide state of the art face down rental supports that help to relieve the stress of being face down for long periods of time. 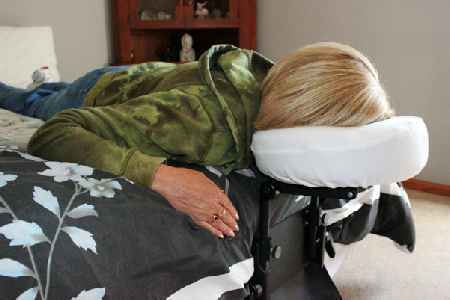 Our face down rental supports are designed to help make your recovery process as comfortable as possible. Please take a minute to view the support equipment that we offer. Then visit our rental packages and prices page to select the rental package that you feel would best suit your recovery needs. If you have any questions please feel free to call us anytime at 1-800-960-6689. We're here to help! Physicians - click here to request brochures. We are available 24/7. Please call us anytime to order face down support rental or with any questions that you may have. We will make sure (when time permits) that your face down support rental arrives 2(two) days in advance of your surgery so that you have time to get acquainted with it. Strong, lightweight and comfortable! 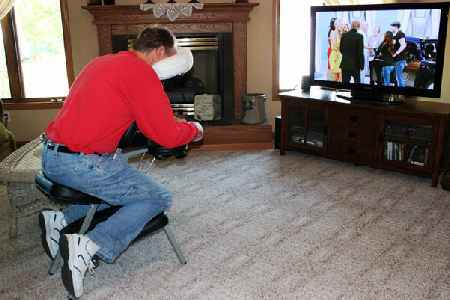 We offer a variety of face down support rentals, all designed to maximize your comfort during your recovery from macular hole surgery or detached retina surgery. Our face down support rental comes with an instructional DVD to assist you in the set up and adjustment of your face down supports for maximum comfort. We are happy to bill the patients insurance for the rental of our supports. Get your support rental today. Call to reserve your equipment. 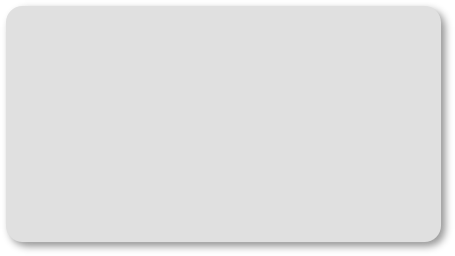 AL- Alabama: Birmingham, Montgomery, Huntsville, Mobile AK- Alaska AZ- Arizona AR- Arkansas: Little Rock, Fayetteville CA- California CO- Colorado: Aurora, Denver, Boulder, Colorado Springs DE- Delaware: Wilmington District of Columbia: Washington, DC FL- Florida: Daytona Beach, Jacksonville, Tallahassee, Pensacola, Gainesville, Orlando, Melbourne, Miami, Aventura, Ft. Lauderdale, West Palm Beach, Palm Beach Gardens, Boca Raton, Lake Worth, Zephyrhills, Tampa, St. Petersburg, Clearwater, Largo, Winter Haven, Ft. Myers, Naples, Sarasota, Ocala, Palm Harbor, Tarpon Springs GA- Georgia: Decatur, Atlanta, Augusta, Savannah, ID- Idaho IL- Illinois: Arlington Heights, Des Plaines, Park Ridge, West Dundee, Maywood, Wheaton, Oak Park, Harvey, Joliet, Oak Lawn, Oak Brook, Riverside, Chicago, Rockford, Peoria, Urbana, Springfield IN- Indiana: Indianapolis, Munster, Merrillville, South Bend, Ft. Wayne, New Albany, Evansville, Lafayette IA- Iowa: West Des Moines, Cedar Falls, Iowa City KS- Kansas: Kansas City, Prairie Village, Topeka, Wichita KY- Kentucky: Louisville, Lexington, Paducah, Owensboro LA- Louisiana: Metairie, New Orleans, Lafayette, Baton Rouge, Shreveport ME- Maine: Portland, Lewiston, Bangor MD- Maryland: Waldorf, Chevy Chase, Bethesda, Rockville, Potomac, Germantown, Owings Mills, Baltimore, Towson, Annapolis, Salisbury MA- Massachusetts: Springfield, Natwick, Worcester, Burlington, Lawrence, Boston, Brookline, Quincy MI- Michigan: Southfield, Detroit, Royal Oak, Ann Arbor, Livonia, Ypsilanti, Pontiac, Flint, Saginaw, East Lansing, Grand Rapids, Traverse City, Williamsburg, MN- Minnesota: St. Paul, Minneapolis, Rochester MO- Missouri: Florissant, St. Louis, Cape Girardeau, Kansas City, Columbia, Springfield MT- Montana NE- Nebraska: Omaha, Scottsbluff NV- Nevada NH- New Hampshire: Concord, Lebanon, NJ- New Jersey: Livingston, Milburn, Newark, Belleville, Ridgewood, Teaneck, Newton, Cherry Hill, Moorestown, Northfield, New Brunswick NM- New Mexico NY- New York: New York, Staten Island, Bronx, Harrison, Mt Kisco, Scarsdale, Yonkers, Bronxville, Suffern, Great Neck, New Hyde Park, Brooklyn, Flushing, Forest Hills, Kew Gardens, Mineola, Rockville Centre, Bayville, Hauppauge, Slingerlands, Albany, Fishkill, Poughkeepsie, Syracuse, Williamsville, Buffalo, Canandaigua, Rochester NC- North Carolina: Winston-Salem, Burlington, Greensboro, Chapel Hill, Raleigh, Durham, Greenville, Charlotte, Wilmington, Morganton, Asheville ND- North Dakota: Fargo OH- Ohio: Columbus, Toledo, Cleveland, Beachwood, Akron, Canton, Cincinnati, Dayton OK- Oklahoma: Oklahoma City, Tulsa OR- Oregon PA- Pennsylvania: Pittsburgh, Brookville, Hermitage, Erie, Camp Hill, Hershey, Williamsport, Bethlehem, Allentown, Scranton, Bala Cynwyd, Huntingdon Valley, Wyndmoor, Wynnewood, Philadelphia, West Chester, North Wales RI- Rhode Island: Warwick, Providence SC- South Carolina: Columbia, Florence, Greenville SD- South Dakota: Rapid City TN- Tennessee: Nashville, Chattanooga, Johnson City, Kingsport, Knoxville, Memphis MS- Mississippi: Jackson TX- Texas: Dallas, Tyler, Arlington, Ft. Worth, Wichita Falls, Temple, Waco, Houston, Bellaire, Galveston, San Antonio, Corpus Christi, McAllen, Harlingen, Austin, Lubbock, Amarillo, El Paso UT- Utah VT- Vermont: Burlington CT- Connecticut: Manchester, New Britain, Hartford, Hamden, New Haven, Bridgeport, Waterbury, Danbury, Greenwich, Stamford VA- Virginia: Fairfax, Winchester, Charlottesville, Richmond, Chesapeake, Virginia Beach, Norfolk, Newport News, Roanoke, Lynchburg WA- Washington WV- West Virginia: Charleston, Huntington, Morgantown WI- Wisconsin: Sheboygan, Milwaukee, Madison, Green Bay, Wausau, Marshfield, Neenah WY- Wyoming.